Before reporting abandoned vehicles to the Council, please note the following points below and contact the correct service. As long as the tax is valid on a vehicle, it is eligible to park on the highway so long as it is not breaking any restrictions on the road e.g. double yellow lines. If an unknown vehicle is taxed that is parked i.e. outside your property then the Council will not investigate unless there are clear signs it’s been abandoned as seen in the Abandoned Vehicle section below. Your first point of call should be to contact the police to see if they have any interest. If a vehicle is causing an obstruction i.e. you cannot get off your driveway this is also a police issue. The Council does not have the powers to remove untaxed/SORN vehicles and therefore will not be investigated. This relates to vehicles parked on the Highway that are out of tax or SORN with little or no damage regardless of age. They should be reported directly to the DVLA here. You can check the tax status of a vehicle here. The Council will investigate any reports that meet the criteria. If the Council feel the vehicle in question has been abandoned, then the appropriate course of action will be taken to start the removal process. Any abandoned vehicle that is insecure or poses a clear health and safety risk will be removed immediately. If you feel the vehicle in question meets the above criteria then please use Report It link at the bottom of the page. If your vehicle has been removed by Tameside MBC you can arrange to retrieve it by contacting us (details below). Please quote the registration number of the vehicle and any reference number we may have given you. On receipt of the form we will advise you of the costs involved and issue a release note once payment has been made. If you no longer want a vehicle and want it destroying, you can surrender it to the Council free of charge using the Report It link at the bottom of the page. A name, address and contact number must be provided to contact you for additional information. The Council will then contact you to arrange collection. You must prove you are the registered keeper by providing ID and handing over the keys and V5C document associated with the vehicle in question. 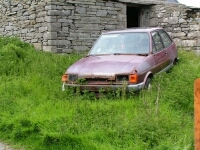 The vehicle will then be collected, scrapped to national standards and a certificate of destruction will be produced.